Campaign for the American Reader: Pg. 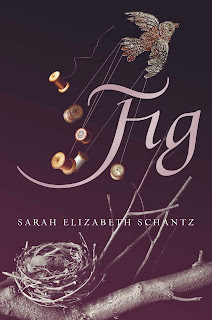 69: Sarah Elizabeth Schantz's "Fig"
Featured at the Page 69 Test: Fig by Sarah Elizabeth Schantz. Love and sacrifice intertwine in this brilliant and provocative debut of rare beauty about a girl dealing with her mother’s schizophrenia and her own mental illness. Fig’s world lies somewhere between reality and fantasy. But as she watches Mama slowly come undone, it becomes hard to tell what is real and what is not, what is fun and what is frightening. To save Mama, Fig begins a fierce battle to bring her back. She knows that her daily sacrifices, like not touching metal one day or avoiding water the next, are the only way to cure Mama. The problem is that in the process of a daily sacrifice, Fig begins to lose herself as well, increasingly isolating herself from her classmates and engaging in self-destructive behavior that only further sets her apart. Spanning the course of Fig’s childhood from age six to nineteen, this deeply provocative novel is more than a portrait of a mother, a daughter, and the struggle that comes with all-consuming love. It is an acutely honest and often painful portrayal of life with mental illness and the lengths to which a young woman must go to handle the ordeals—real or imaginary—thrown her way.